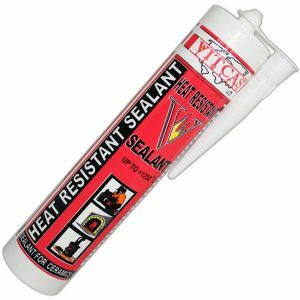 VITCAS Heat Resistant Sealant is a ready mixed high temperature sealing and caulking paste for use in fixing and jointing as well as for fire protection. Application: Make sure the area is clean and that all dirt, dust, rust and grease is removed. Cut off the top of the cartridge, screw on the nozzle and cut the nozzle to the required size. Apply using a cartridge gun and aim for a thin joint of 2 – 3mm. The material will set at room temperatures but the time will be reduced by applying heat, gradually increasing over a four hour period. The natural colour is off-white / beige when dry but the sealant can be sanded and overpainted.